Capcom is expanding its push into Hollywood, according to the Hollywood trade paper Variety. Not content with a new Street Fighter movie and the possibility of a fourth Resident Evil flick, the publisher has reportedly signed a deal with Warner Bros. that will see the Xbox 360, PlayStation 3, and PC action game Lost Planet: Extreme Condition hit the big screen. The movie will apparently be produced by Seaside Entertainment (likely in conjunction with Capcom), and the screenplay assignment for the project has gone to David Hayter. Familiar to gamers as the voice of Solid Snake in Konami's Metal Gear Solid series, Hayter has a wealth of experience as a writer, having penned the upcoming film adaptation of DC Comics' Watchmen, as well as the first two X-Men movies. The article didn't discuss possible casting, storylines, or release dates, but the location is likely set in stone (or snow, as it were). The game's defining characteristic was its frigid setting, a planet in the midst of a brutal ice age, and populated by menacing aliens. The film is expected to be announced formally during Capcom's E3 Media & Business Summit press conference Tuesday afternoon. Beginning with Castlevania on the Nintendo 64, Konami has for the past 10 years rendered Koji Igarashi's famed vampire-slaying franchise on consoles in 3D, while maintaining the series' traditional 2D aesthetic on handhelds. Throughout that span, the publisher has maintained a consistent record of winning critical praise for its side-scrolling handheld efforts and receiving a generally tepid reception for its console games. With Castlevania: Order of Ecclesia slated to arrive on the Nintendo DS this fall, Konami is once again returning with a 3D console game: Castlevania Judgment for the Wii. However, rather than taking another crack of the whip at the action adventure genre, Konami has a mind to reinvigorate the franchise by entering the Belmont clan and its demonic nemeses into a battle-royal fighting arena. Though Konami has named no specific fighters, the publisher said that it would be pulling its cast from the franchise's entire 22-year history. Making use of the Wii's motion-sensing control scheme, Konami notes that players will control their fighters using the Wii Remote and Nunchuk to attack, along with brandishing objects and items strewn around the 3D environments. 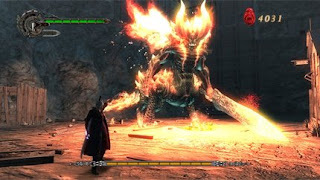 Players will also be able to set traps as well as enlist monsters to fight for them, though Konami did not expound on the nature of these mechanics. Castlevania Judgment will feature an online fighting mode, and will also interface with Order of Ecclesia on the DS for added gameplay content. The game is expected to ship for the Wii this fall. PC gamers have to tip their hats to Capcom. With most of the company's major console releases also appearing on the PC, action fans don't need to run to a console to experience third-person action games like the upcoming Bionic Commando and the already released Devil May Cry 4. What you will need, however, is a gamepad. We plugged in our handy Xbox 360 wired controller for some bloody Devil May Cry 4 action this week; keyboard controls are supported but this game is simply way too fast. Almost immediately--that is, after the awesome opening cutscene of the type that the DMC franchise is known for--we started slicing and dicing through hordes of evil creatures and sending them back to the darkness from whence they came, collecting proud souls in the process. For those new to the franchise, proud souls are the glowing orbs that you are rewarded with for offing enemies with particularly nasty combos. They act as currency to upgrade your weapons and purchase additional combos. Oh, and you play as Nero, a towheaded warrior armed with his trusty Blue Rose pistol, Red Queen sword, and a demonic arm called the Devil Bringer. To really get a handle on DMC4, check out Kevin Van Ord's review of the console version that was released back in February. We're here to talk about some of the exclusive PC features. First, there are two new modes. Turbo mode speeds up the action so you'll be sure to develop some calluses on your thumbs as you unleash combos at a ferocious pace--as if DMC4 wasn't already fast enough. The Legendary Dark Knight mode will put your gaming rig to the test because it will up the enemy count, sometimes to more than 100 foes onscreen, so be sure to sharpen your sword. Also, enemies will be located in different areas than the console version, which is a simple change of pace for those who have played DMC4 before, and a good touch if not exactly revolutionary. If your rig is struggling with all of the blood and gore, you can of course customize your graphics settings within the game or try out the new benchmark testing, a series of boss fights that test your rig to see if it's up to the challenge. Earlier this week we blasted through one of the many boss fights, this one against a demon who thinks he's an angel. Using the Devil Bringer, we latched on to the enemy's face, jumped over his body, spun around, and then unleashed a barrage of aerial attacks followed by a few pistol blasts for good measure. A quick note: Bullets don't usually work on bosses, and they didn't help here. We dodged the demon's impossible-to-block sword attack and the giant gold spears he hurled at us, and then repeated the Devil Bringer combo attack until he was defeated in a gloriously gory cutscene that you have to see for yourself. 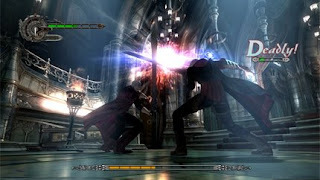 The experimentation of the swordplay is really the biggest draw to the combat in DMC4. Timing is everything, and a split-second difference between button presses can change a combo completely. Perfectly executed combos may initiate a deadly finishing move that is so fun to watch you'll wish your rig had TiVo. Visually, DMC4 looks amazing. The lighting and textures improve on the game's console counterparts, and it takes advantage of the PC platform. The sweeping theatrical cutscenes run at 120 frames per second, which puts the 30fps scenes in the console version to shame. Plus, you can play it in either DirectX 9 or 10. Even though you had to wait until now to play DMC4 on the PC, kudos to Capcom for giving the PC version exclusive content and features that the platform deserves (and for only $39.99). n "Ninja Gaiden II," gamers must guide Ryu Hayabusa on a mission to avenge his clan and prevent the destruction of the human race. Armed with an assortment of ninja weaponry, players must help Ryu skillfully maneuver through a world fraught with peril. "Ninja Gaiden II" will feature an all-new gameplay engine, a new auto-health regeneration system, levels, adventures, enemies and thrilling combat with an extensive assortment of ninja weaponry, representing a true evolution of the highly popular franchise.